Social media marketing for Toronto-based companies is a must because they need every edge they can get in the crowded market. However, while social media is a part of most companies’ marketing strategy now, many do not realize how much of a direct effect it can have on sales. When it is done effectively, social media marketing can boost business revenue and profit. For many companies, social media marketing is now the main method of obtaining new customers and making sales. Here are just a few of the ways that social media marketing can increase and boost sales for your business. Create Fan Pages – When you want to advertise or promote your company, what’s better than having your customers do the work for you? Fan pages on social media sites allow your customers to promote your services by word of mouth. Plus, with sites that allow tagging, your customers can tag their friends or family in posts about your products or services, which can lead to increased sales. Communicate With Your Customers Personally – One of the great things about social media is that it allows you to add a personal touch to your marketing. You can engage and directly interact with your customers, which can help increase customer loyalty. Customers like to be treated like individuals, and social media allows you to do that. Starting discussions or creating social media campaigns that rely on your customers’ engagement can help cement your company as the right option in your customers’ minds. Receive Feedback – With social media marketing, you lose some of the control you would have with traditional marketing. However, what you gain is the ability to receive instant feedback from your customers on your products and services. If there is a problem with a product or service, you will find out about it more quickly and can implement a solution sooner. As well, when a customer has a problem, you have the ability to quickly resolve the complaint, which can help turn him or her back into a satisfied customer who will make more purchases. Prioritize Customer Responses – There is no platform that is quicker than social media. When customers are having a problem making a purchase or have one last question they need answered before deciding on your company, you can quickly and easily settle their issue and finalize a sale before they change their minds and move on to a competitor. Integrate a Store – With social media, you can directly integrate or link an e-store into your social media pages, thus turning your marketing into an actual sales front. This means that while people are interacting with your social media content, they can also make purchases. By combining your marketing and sales, your customers have your company in their mind and can make fast, on-the-spot purchases. Reach People Quickly – When there is a PR disaster or blowback against your company that could threaten sales, you have the ability to respond quickly to defuse it. It’s crucial in these circumstances that you have a social media professional who can resolve your issue effectively. With social media, you can prevent the big mistakes that can cost your company its sales. 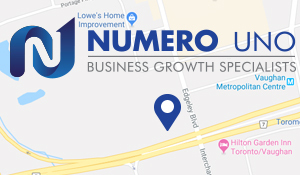 Numero Uno Web Solutions is a Toronto-based provider of search engine optimization (SEO), content marketing, and mobile optimization solutions to startups and small companies from all industries and fields. We stay on the pulse of industry changes and adapt our practices to produce quality SEO and content marketing plans to fuel the growth of businesses across communities. Contact us to learn more about social media marketing in Toronto and how we can help improve your search profile.